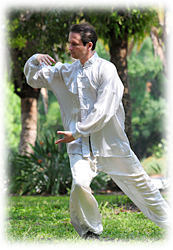 Filipp Gadar started learning Tai Chi as part of his school curriculum at East West College of Natural Medicine under the guidance of Dr. Zou Zheng Wang, a former champion Tai Chi performer among TCM colleges in China. After completing the Tai Chi program required at school, he continued to train in Yang style Tai Chi (including the straight sword) with Dr. Wang privately for several years. Filipp finds that his consistent practice of Tai Chi helps him stay in good physical and mental shape, and helps greatly in his acupuncture practice. The unique combination of his experience as a professional ballet dancer with the Bolshoi Ballet and his apprenticeship with his Tai Chi mentor gives him a unique background for tutoring those who are committed to learning the practice of Tai Chi. Filipp Gadar offers community Tai Chi weekly. Please call 735-6786 for the current time and location. All the movements require absolute concentration. The movements are in rhythmic harmony to the breath. The movements are done slowly. The movements are performed in a smooth, continuous way.